This TI-30X IIS was manufactured by Kinpo Electronics, Inc. for the Wal-Mart sales chain. It was released for the Back-to-School 2004 campaign together with a lime-green TI-30X IIB. Don't miss the orange TI-30X IIS sold in the Wal-Mart stores mid of 2005. Texas Instruments introduced in France end of July, 2005 the colorful TI-Collège. 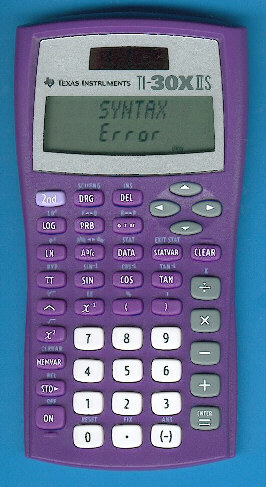 In 2005 Wal-Mart's biggest competitor in the U.S., retailer Target, introduced a lime-green version of the TI-30X IIS. Within a year we even got a pink edition of the TI-30X IIS. We discovered in August 2010 a slightly different version of a purple TI-30X IIS, please focus on the color of the [2nd] key and the associated functions. At first glance this stylish calculators seems to be identical with the original TI-30X IIS but we discovered again some minor differences to the already known versions. Please click on the pictures below to understand the differences. The TI-30X IIS sold by Wal-Mart gives some advertisment like "Best Selling 2-Line Display". In 2006 the design of the box was changed and added the slogan "#1 BRAND used by students - BUILT TO LAST". identical with the first models released already in 1999. © Joerg Woerner, September 12, 2004. No reprints without written permission.